This sarita is a truly spectacular example in which the paired panels display an unusual variety of finely executed motifs, creating a sense of vibrant rhythm. It has been crisply executed in the local batik technique and dyed with indigo. Asymmetry lends an additional dynamism: here and there, contrasting motifs are placed in opposite panels. The ends, as is very typical, are finished with rows of long triangular motifs (passora), here executed in tiny dots. The row (a double row on the opposite end) of larger dots above the passora is called "coins" (pa'katte'katte') and represents the desire for wealth. The crenellated band above that is called pa'pollo'dodo ("hem of a woman's sarong"), a reference to the appliqued patterns on the borders of locally woven sarong once worn on festive occasions, which can be seen in some old photographs. A figurative panel (at the bottom of the section farthest to the right) shows two men plowing with a pair of water buffalo, a tadpole swimming away from them on either side. Above this we see a four-lobed design depicting leaves of the water hyacinth (pa'daun ambollong). This design is sometimes alternatively named after the fruit of a tree (pa'bua tina'). Rows of ribbed, fishbonelike patterns are called "backbones of eels" (pa'buku masapi), a symbol of strength. They surround a man in one panel who holds in one hand a bird and in the other a small animal, possibly a dog. The crisscross pattern above this is known as "chiles" (pa'bua pana'), while a pattern of concentric rings (pa'lola') depicts circular gold heirloom ornaments and closely resembles a house-carving motif called pa'barre allo or "sunburst." Above this, the sinuous spiral design on one side represents "tadpoles swimming here and there" (pa'bulintong siteba'), while the other panel contains stars (bintoen) in the bottom half and a circular pattern above called pa'pollo'songkang (ends of bamboo tubes). Next on one side is the powerfully auspicious pa'doti design of stepped lozenges, together with a group of daggers (gayang, a mark of nobility), and knives. Most unusual is the organic and asymmetrical pattern of twisting lines in one of the next long panels, the name of which has not been identified. 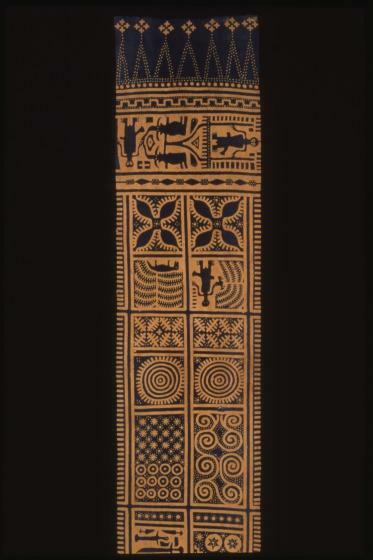 On the other side is a variant of the bitter gourd motif (pa'buku paria). At the foot of each of these panels is an animal, a dog or a horse on one side and a buffalo on the other. A little more than halfway down the middle section, a small square panel is filled with birds pecking, probably hens. Above it, an interlocking key pattern is named after the typical hooked motifs found on beaded heirloom ornaments (pa'sekong kandaure); the design next to it is said to be a variant of buffalo ears distinctive of the Pangala region. Next come two tightly packed figurative panels. On one side is a man on horseback, while on the other we see a man armed with sword and shield, accompanied by two small horned animals probably representing the anoa (Bubalus depressicornis), a dwarf buffalo species unique to Sulawesi. Toward the upper end of the leftmost section, we see a pair of square designs with radiating spirals called pa'kapu'baka (bindings of a lidded heirloom basket), a motif also common in house carvings and a symbol of prosperity. A man in one of the net panels carries a bamboo tube, perhaps for palm wine, and a small bird. Above the man's head is the design called pa'talinga (buffalo ears), generally said to represent the hope for many buffalo, and on the other side, the ribbed patterns of eels' backbones and a motif (looking somewhat like a Union Jack) that is called pa'isi santung, or clappers of small brass bells shaken in the climactic procession at the greatest Rite of the East, the ma'bua'pare. Two horses or dogs can be seen at the bottom of the panel. Below the radiating leaves of water hyacinth comes a narrow band of small squares with tiny white dots, identified as pa'batan-batan ("gold beads," which are sometimes worked with just such a granulated pattern). The final figurative panel again depicts men plowing among the tadpoles. Below it is a spiral motif with a comblike array of vertical lines, a variant of the pa'tangke lumu' or water weeds pattern. The entire cloth is dense with symbolism expressing the hope for wealth and abundance. Roxana Waterson, "Sacred textile (sarita) (details)," in Eyes of the Ancestors: The Arts of Island Southeast Asia at the Dallas Museum of Art, ed. Reimar Schefold in collaboration with Steven Alpert (Dallas: Dallas Museum of Art; New Haven and London: Yale University Press, 2013), 198-199.